Southern Sky is an exceptionally well constructed and nicely fitted out long distance Australian registered cruiser proudly built by her one and only current owners. They launched her thirty years ago and have covered many thousands of sea miles on her so she has with out any doubt, proven herself more than capable of blue water cruising. Everything about Southern Sky reflects pride of build and has classic fittings that says 'seamanship'. Sensible proportions, good hand holds throughout, plenty of storage, superbly maintained 54hp Yanmar diesel, windvane or autopilot steering, AIS, radar, extra fuel storage, plenty of ground tackle, sensible draft, extensive sail wardrobe and excellent rigging. 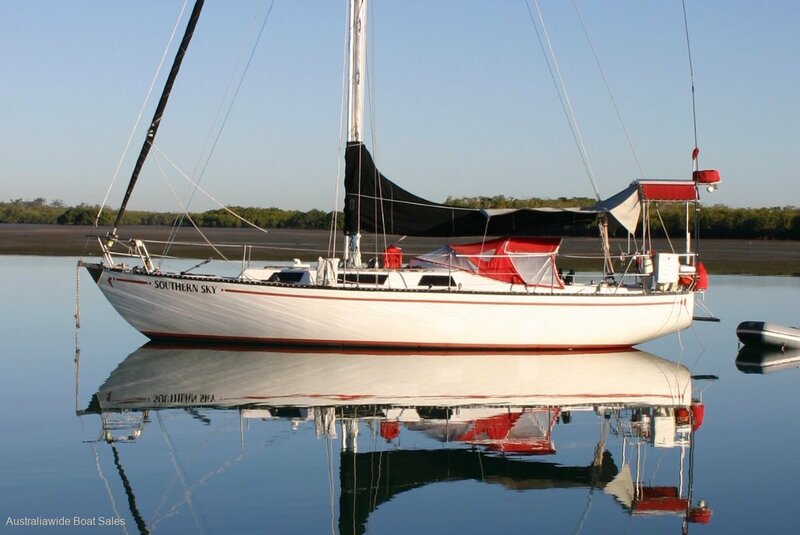 She is very well set up for short handed sailing so an adventurous couple would be most comfortable aboard her warm, compact and well laid out interior and deep, safe cockpit. For those with their sights on distant lands and far-off horizons, Southern Sky should be on your shopping list. Contact Australiawide Boats Sales Manly Qld office to arrange an inspection. Fin keel with lead ballast. 54hp Yanmar 4 cylinder diesel with stainless shaft, PSS shaft seal and swinging a 4 blade "Eagle" prop. 200 Litres via stainless steel tanks. 180 litres in two tanks, Spectra watermaker. Top loading Danfoss 12v fridge / freezer. Spectra Cape Horn, 12 volt 60 l/hr. Two MOB rings, Danbuoy, 4 person Zodiac Liferaft (needs service), 406 EPIRB, Coastal Flare Kit. Warm well presented timber fit out with double V berth for'd, quarter berth stbd aft, and single pilot berth. 186cm headroom thoughout, 6 turbo interior fans, can sleep up to 6 people if required. U shaped dining area that can covert to a double. Cold water Shower in head and aft deck. Pioneer Radio, Kogan 19" LCD TV. Dodger & bimini, cockpit covers, main sail cover. Muir Cheetah winch, Rocna 54lb, Fortress 37, CQR 45lb, 80 metres of 10mm chain, 40 metres secondary chain. Raymarine C120 MFD in cockpit, (Radar, AIS, Depth), Standard Horizon VHF, Simrad wind instruments, (New 2017), TMQ AP4 autopilot, Icom HF radio with pactor modem. Deck stepped double spreader, cutter rigged sloop with removable inner stay. Dyform stainless steel standing rigging new in 2013. Hutton Arco 2 x 57's, 5 x 45's, two speed winches, Monitor windvane with spares, spinnaker pole, jack stays, stern mounted BBQ, fenders mooring lines.